There were no real surprises in the Crime Stats for December 2017. The number of calls were down slightly, as was the percentage of reports to calls. The numbers for December 2015 were provided by the San Bernardino County Sheriff's Department. They stopped providing us these numbers in October of 2016. Teresa Sitz, the MAC Delegate for Wonder Valley, has been teasing our stats out of media reports since May of 2017. This is tedious work. The stats are unofficial, and there is a small margin of error. There were approximately 6 calls for burglaries in December, with one arrest. This was at the Wonder Valley Thrift Store where 3 people were arrested. An additional arrest was on a warrant. Because we are lacking crime stats between October 2016 and April 2017, I've taken a three year slice when stats were available - May through September. 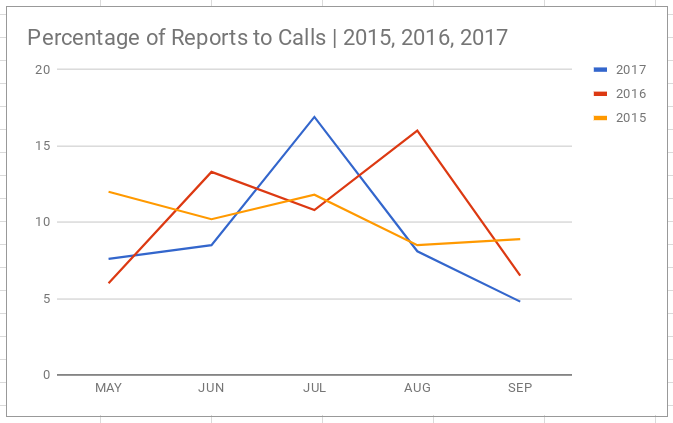 Reports per calls peaked last year in July at 16.9% and declined steadily until December when it peaked again at 11.7%. It's difficult to assess, in any quantifiable way, the quality of service that we receive from various county agencies. The percentage of reports to calls may not be of much use, but it is one metric that is available to us when others, including monthly crime stats, are not. The residents of Wonder Valley want to maintain an effective Neighborhood Watch, but without assistance from the Sheriff's Department, and without meaningful metrics to gauge how we are doing in our efforts, results are anecdotal at best. We are left not knowing how to best spend our energies in crime prevention. The Sheriff's Department has really stepped up to help us with illegal shooting in Wonder Valley. Detective Dominic Vaca has been assigned to address the problem and came to last month's meeting to hear resident's complaints and offer advice.